Your camping gear isn't complete without a portable canvas folding chair. These chairs are ideal for setting up anywhere so you can sit comfortably and relax. A number of these chairs have cup holders, armrests, and headrests. They also include polyester bags or sacks to carry them in. When shopping for one of these chairs, test it out first. Make sure the chair feels comfortable and gives you the support you need. Are the armrests at the right height? Also, check to see that the material is really canvas and not some flimsy plastic. Canvas is a heavy-duty fabric and used when sturdiness and durability is required. It is usually made of a tight cotton weave. With a large selection of canvas folding chairs on the market, you will be sure to find something to suit your outdoor needs. Want something to take a nap on? The Home Marketplace has a colorful canvas hammock chair for those who want to have more room for lounging. This colorful chair supports up to 250 pounds and is 38 inches long by 25 1/2 inches wide and 41 inches high. It reclines to four positions. Director chairs are also made of canvas and fold with ease. Available at Target, these chairs sell for about $40 and come in a variety of colors including burgundy, orange, green, yellow, and teal. If you would like something a little higher off the ground, Target's Counter-Height Director's Chair might suit your needs. This chair comes in many colors, has a black frame, and weighs only 13 pounds. It sells for $50 and can also be found on the store's web site. For those with back pain, try the Ortho Seat, an extremely lightweight chair made of rubber tree slats and canvas. At only one and a half pounds, this water resistant and long-wearing chair can be folded into a small bundle. It comes with a shoulder bag for easy transport. The chair provides great back support. Ozark Trails offers kid-size folding camp chairs at Walmart. Each chair is made of polyester canvas and includes a drink holder in the armrest. Now, little ones can have a chair to match yours. The folding chair has many uses. Take it to the game or bar-b-que. In the summer, this chair sits nicely on the beach. Pop open a sun umbrella above it, and you have a shady spot to sit and watch the waves or read the latest novel. When you camp, place your chair under a tarp that you've set up as a sun room. Then enjoy a meal of hot dogs or hamburgers, hot off the grill, while sitting in the chair and dine from a camping table. Carry it with you to sit on when you fish at the campsite's lake or river. Be comfortable reclining after a long hike on the trail. Place a lantern next to your canvas chair and read after the sun sets. 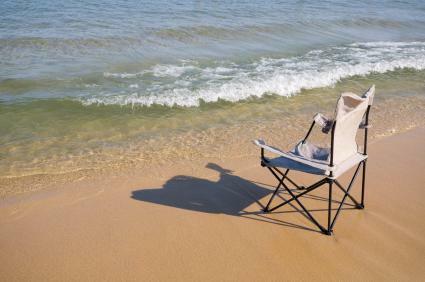 Enjoy each season in your portable canvas folding chair!